Originally written September 19, 2011. My trip to the Philippines got off to an uneventful start. I can’t quite explain it, but I was just out of sorts. I was enjoying the scenery and Puerto Princesa had some charm. Largely, I was a bit unsure what to do with myself. I ate. I ambled around the city. Consulted the Lonely Planet guide. Scratched my head. Popped into a bar. Drank a gin and tonic. Ambled a bit more. And finally I made it back to my hotel at an hour that I had hoped would not make me feel like a complete loser. I checked my watch. It was 9:15. Damn. I went to bed with the knowledge that I would be heading to El Nido in the morning, and my SCUBA training would begin. I also had the knowledge that a wake-up call would be forthcoming. It was not. Thankfully, I’ve always had a good internal clock, and despite a gloriously pitch-black room, I managed to wake up in time to get sorted and out the door. The ride was long and uncomfortable, A German couple sat next to me, so I felt awkward about pulling out the book I had been enjoying, Antony Beevor’s The Fall of Berlin 1945. I sat in cramped silence for the next five hours. Upon arrival, we were immediately accosted by a dozen tricycle drivers, all offering us rides. I had to fight them off. First of all, I had no idea where I was going. 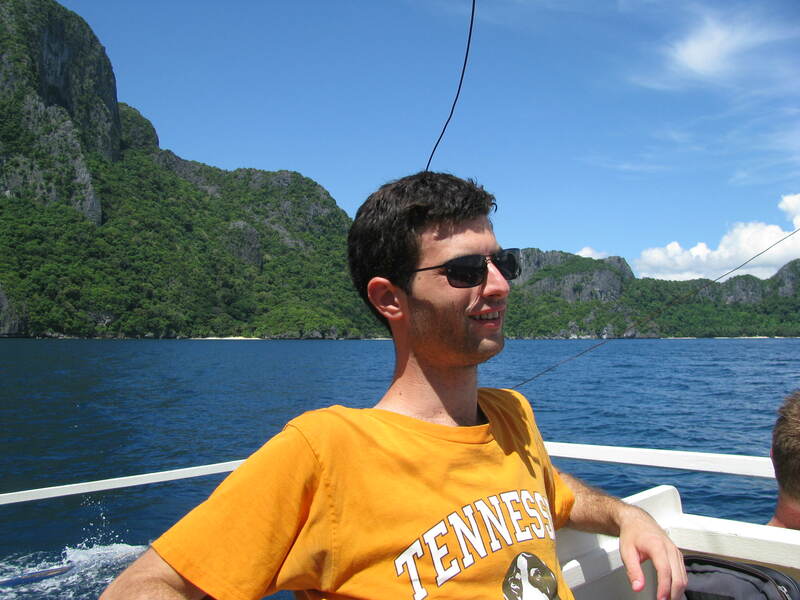 Secondly, El Nido is tiny, and I was pretty sure I could find it on my own. I asked the desk clerk of the first hotel I stumbled into. She pointed to a sign, perhaps 50 yards away that read “Palawan Divers.” And this is where fortunes picked up. I met with the owner of this shop, Jose. He’s from Miami and moved out here when his previous business Stateside went south. They started me on the book work almost immediately, so I could begin my confined and open water dives the next day. After completing the confined water dives, we set out on the first of four open water dives. Had my jaw not been busy holding the regulator in place, it would have been on the ocean floor. The diversity of life on even the smallest patch of coral was better than any tank or aquarium I had ever seen. Small, iridecent blue fish darted in and out of cracks. Shrimp peaked their heads out of the rocks, only to scurry away. Flat fish blended perfectly with the ocean floor, a testament to the beauty of evolution. Indeed, I would have missed out on many of these sights were it not for the well-trained eye of my instructor. As we descended along the gentle sandy slope, I kept checking our depth and thinking “We cannot possibly be 30 feet below sea level,” and so on. It was unnerving and alien, but also somehow natural and exhilarating. Mere minutes into the dive, Pod pointed to the murky distance. Like so many other times on this dive, I had no idea what he was pointing at. And then I saw it: a sea turtle. I only saw the vague outline of a checkerboard patter in a semicircle, but soon it became obvious what we were looking at. It was grazing on seagrass. Pod made a gesture like he was taking pictures. Sadly, neither of us had a camera. We swam alongside it for a bit, until it had decided to be done with us, and it was gone. And like that, my first open water dive was complete; I would need three more the following day to complete my certification. We got off to a slightly later start on Day 2, but the sights were even more spectacular. 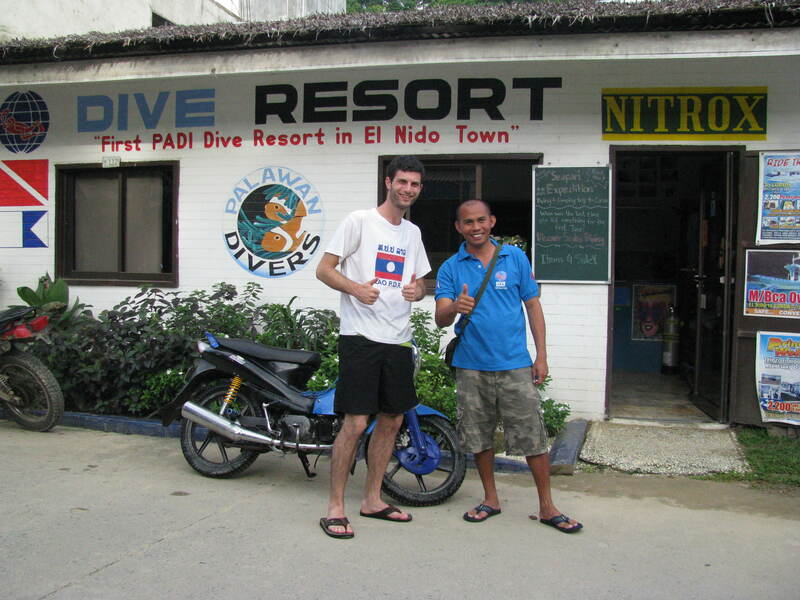 We were joined by three Spanish tourists, one of whom would be starting his Divemaster training. Our first site was an island with a nearly vertical wall of coral reefs. It was unique from what I had previously seen, although it had the effect of being mildly disorienting. The ocean floor dropped away into oblivion beneath me, and the nothingness extended perpendicularly into deep blue-green away from the island. While the formations were spectacular, the wildlife was relatively sparse. The most exciting animals on this dive was a small gathering of tiny cuddle fish as we were preparing to surface. However, this would change quickly in our next dive. The second dive site was like a crossroads for the local wildlife. We swam over giant cabbage coral and saw giant schools of yellow snapper. Pol took this opportunity to turn to me and make a gesture as if he were eating them. I agreed. This was a particularly exhausting dive, as we faced a moderate current throughout most of it. I was definitely ready for lunch by the end of this second dive. Finally, our last dive seemed to have a bit of everything. We saw multiple sting rays, including, as Pol enthusiastically put it later, “That is the kind that killed the killed The Crocodile Hunter!” We saw more stone fish, a lobster, and thousands of other fish. We also swam through a small tunnel. When we finished, I had completed my certification and there were congratulations all around. My jaw and gums were sore from holding the regulator for two days straight, my forehead was bruised from the mask, and my toes were blistering from the fins. And it was all worth it one hundred times over. ***NOTE: Sorry for the uber-late post. I did a REALLY great job of getting away from technology for my vacation, and not a great job of coming back to it. I agree, Had a great day of divnig on a small lake in Ohio today! The vis is much better than earlier in the year. Can’t wait to see the conditions in another month. Just remember to have the shore goodies ready! Hot chocolate is never better than after a good dive and standing around talking about it while holding onto a steamy mug!